Maria Panaritis, standing left, talks with old Beverly Hills Middle School metal shop teacher Jim Doyle. Imagine you are at lunch with 19 of your former middle school teachers. One shows up with a 1984 grade book with your test scores in it. Another, who helped you make bullets in metal shop, talks about how he used to prank that social studies teacher now holding your grades. The science teacher who made batteries from salt water and tin foil sits genially among them all. It is loud. Orders are flying for French onion soup, chicken dumplings, french fries, apple sauce. Your head is spinning. Are you dreaming? Are you dead? I party-crashed a lunch of teachers from Beverly Hills Middle School. What would they remember of me? Remember of any of the easily 50,000 or more kids they’d taught over decades in one of suburban Philly’s grittiest towns, Upper Darby? I knew only this: In the 1980s they had somehow managed to glue together Greek immigrant kids, Vietnamese refugees, kids of Catholic and Protestant-American parents, and sent us off as a hormonal mass of humanity to another grit factory, Upper Darby High. Retired math teacher Bill Elder shows Inquirer columnist Maria Panaritis photos of her eighth-grade self. Former Beverly Hills Middle School principal Mel Brodsky is to her right. Seated is former social studies teacher Bill Coren. They did so at a place that was so NOT Hollywood: Beverly Hills was a monster of a building. Had a musty auditorium. Faced noisy trolley tracks and drew kids from row houses and twins crammed along the West Philadelphia border. I knew at least one teacher remembered me: Joyce Ash (now Hurt) from seventh grade science. She had emailed after recognizing my name in an Inquirer column. She told me about the lunch. I began begging to spy on the monthly reunion bash. The rest is history. A sixth grade class outside Beverly Hills Middle School in Upper Darby, 1981-82. Inquirer columnist Maria Panaritis is fourth from left, middle row. >> READ MORE: Yo, Suburbs! All the way from Upper Darby, I’m your new columnist. On Tuesday afternoon, I drove to Charlotte’s Restaurant in Newtown Square, walked inside with sweaty palms, and it began: a march into madness. Inquirer columnist Maria Panaritis, center, in a seventh grade music class picture at Beverly Hills Middle School in Upper Darby, Pa., 1982-83 school year. A man approached with wire-rimmed glasses and a familiar cherubic smile. My brain sorted through a tangle of Air Supply and J. Geils Band lyrics before locating the spot in the cerebral cortex where this person’s name had resided, untouched, since 1982. Beverly Hills Middle School print shop teacher Dave Schramm ran the school newspaper. Print shop. He taught 11-year-olds to make business cards, notepads, and the monthly school newspaper, the Junior Post. I once partied over franks and beans at Schramm’s house. Won a game of Clue against all the other Junior Post nerds. VINTAGE! An original November 1981 edition of the Junior Post student newspaper, minted in industrial arts teacher David Schramm's print shop classroom at Beverly Hills Middle School in Upper Darby, Pa., and later sold for a dime in the hallways. Lunch organizer and retired foreign language teacher Gay Marshall had warned everyone I was coming. “How old are you?” I asked Mr. Schramm. Dave Schramm, print shop teacher and leader of the Junior Post student newspaper at Beverly Hills Middle School in Upper Darby, Pa., from a 1983-84 yearbook. As a student who would steer clear of both detention and income growth in the decades ahead, I knew Mr. Frederick only from a distance. He surprised me, though, with this: He’d been the one who launched a weekend Poconos camping trip that gave us poorer kids our first experience with the woods at night. I gave him a high five. That trip killed. Retired Beverly Hills Middle School assistant principal Bob Frederick taught in the 1980s. Teachers were howling as they circled two banquet tables. I tried to identify them, one by one, but it was like staring at a strobe light. I locked eyes with one across a table. Me: “Are ... you … ALGEBRA?" We were shouting like chimpanzees. She told me she has pictures of me at home. That I was a math sleuth who helped run the make-pretend school bank. This was news to me. Karen Balawender and Bob Keller greet. A boisterous baritone rolled through the room. I turned and there he was: Same grasshopper-like build, same dark hair, brown eyes, wiry energy, and dark-rimmed glasses he wore in class 35 years ago. Mr. Coren. Eighth-grade social studies. I loved this guy. Social studies teacher Bill Coren in "Roaring Twenties-theme-week" garb in the 1981-82 school year at Beverly Hills Middle School in Upper Darby, Pa.
Former Beverly Hills Middle School social studies teacher Bill Coren arrives with Panaritis' grade book. The spiral-bound grade book that retired teacher Bill Coren has kept of his eighth-grade social studies class from Beverly Hills Middle School in Upper Darby, Pa.
Me: “THAT IS SO GROSS." Bill Coren plopped down a red, spiral-bound grade book. Told me he has all but two from the 35 years he taught at BHMS, starting in 1972. He flipped it open as I tried not to faint. Bill Coren's grade book with grades Panaritis received in his class in 1984. “You got a 100 on your test in the second quarter and you led,” he said with the same rapid-fire cadence I remembered. “You got the only hundred on the test. Second quarter – oh. Whoa! Is that you? YES. That’s a late assignment right there. ... Let’s see over here. (Page flips.) Panaritis. ..."
Bill Coren talks to his former student Maria while, to his right, former science teacher Joyce Ash (now Hurt), who made this happen by reaching out to Maria after reading one of her columns, talks with math teacher Barbara Mendell. So these were the old teachers. This was why they have stuck to the brain, even if only as fuzzy memories. They loved each other, I realized. They loved us just as much, “lower-middle-class kids who came from loving families, mostly," as Miss Ash (now Joyce Hurt) so gingerly put it to me. Our diversity forced them to be extra creative in class. They were fearless. Principal Mel Brodsky (also at the lunch) had their back. He let them design theme-based weeks where we’d come into school in costume: The Roaring Twenties, Mesopotamia, the Civil War. Coren once commandeered the public address system to prank Brodsky - and he didn’t get fired for it. Metal shop teacher Jim Doyle and the other shop teachers would torment Coren during parent-teacher meetings. And on and on. “You wouldn’t believe the stuff we did,” Doyle said. Kids made bullets and rings in Jim Doyle's Beverly Hills Middle School metal shop class in the 1980s. I believe. And I can’t say thank you enough. For any readers interested in sending a remembrance to Maria or digitally through the Google form embedded in this story, she’ll be happy to forward them to your old teacher. 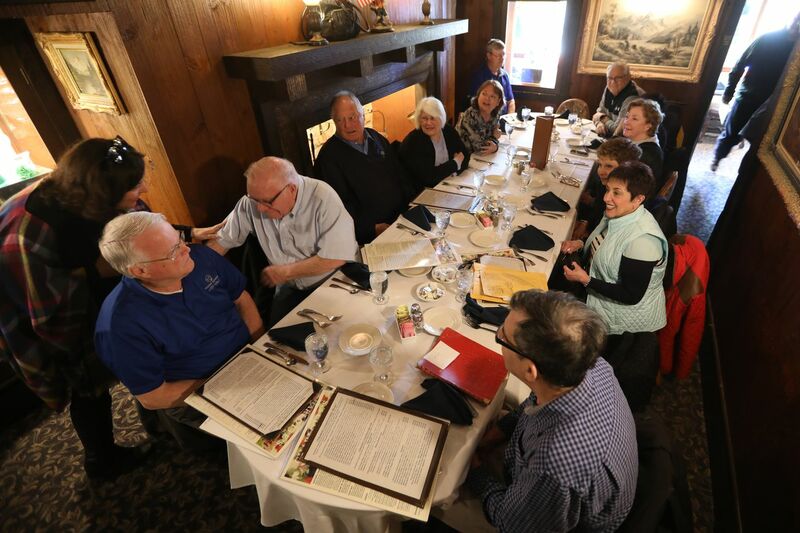 Here are names of all from Beverly Hills Middle School who gathered for the reunion lunch: Bob Keller, Bob Frederick, Lee Urwiler, Mark Graboyes, Phil Over, Gay Marshall, Dave Schramm, Jim Doyle, Wayne Burns, Barbara Shafer, Karen Balawender, Dan Houck, Bill Elder, Mel Brodsky, Merle Horowitz, Beverly Nicholas, Barbara Mendell, Joyce Ash (Hurt), Bill Coren.